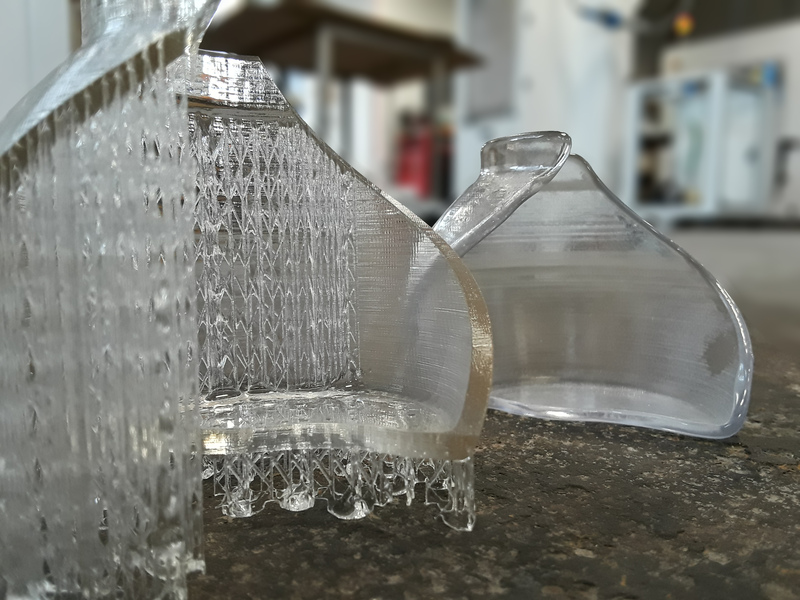 New York-based automated post-printing developer PostProcess Technologies has announced a new solution for 3D printed SLA resin removal, expanding its catalog of automated additive manufacturing post-print technologies. The new PostProcess solution enhances the chemistry of the company’s existing portfolio of SLA Resin Removal technologies, and is said to be one of the fastest processing options on the market. “PostProcess’ latest innovation of the most advanced SLA resin removal solution in the world reinforces our commitment to providing the AM industry with transformative post- printing solutions enabling the market to scale”, commented Jeff Mize, CEO, PostProcess Technologies. 3D Printed SLA part with resin supports removed using new solution. Photo via PostProcess Technologies. PostProcess claim that its new solution can consistently remove all resin on SLA 3D printed parts in 5 to 10 minutes, with the ability to clean up to 5 times as many parts before the detergent saturates, compared to traditional solvent resin removal. 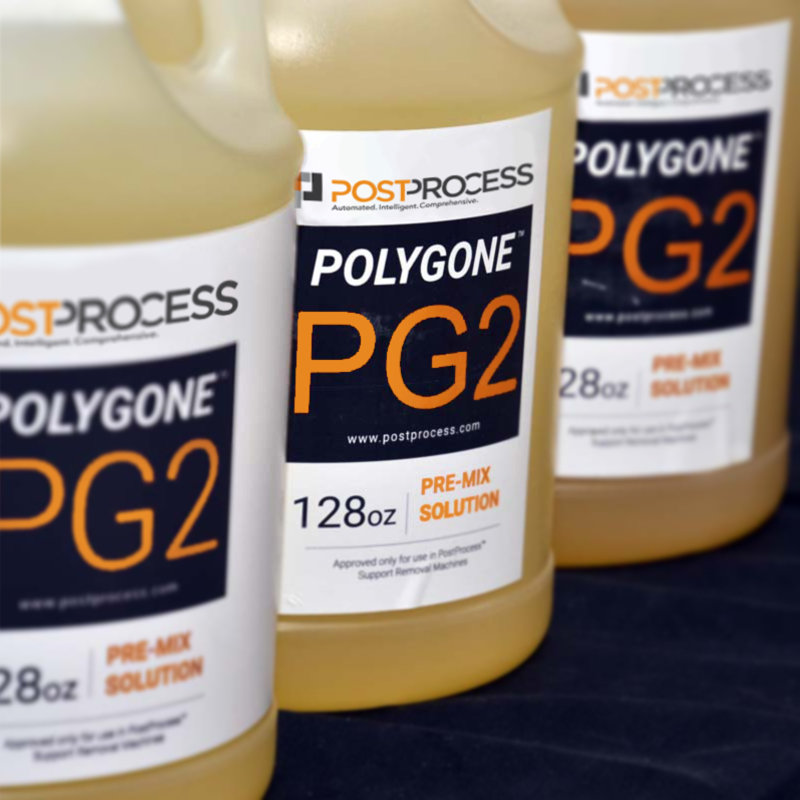 The chemistry of the new SLA resin removal solution created by PostProcess, called PG1.2, is designed to enable a longevity in the post-printing process as well. The company states that the PG1.2 can provide resin removal on up to 1000 15” trays in its DEMI support removal machine, before it becomes saturated. Additionally, the new solution is said to increase productivity for technicians by reducing the number of steps required to go from print to finish. Finally, the PG1.2 chemistry also addresses health and safety concerns with a lower vapor pressure and higher flash point compared to traditional solvent solutions. PostProcess’ POLYGONE™ (PG) chemistry line. Photo via PostProcess Technologies. The new solution was validated by PostProcess with 8 different resin materials in various production environments to ensure its capabilities. It is designed to be used with PostProcess’ Submersed Vortex Cavitation (SVC) technology utilized in its DEMI and CENTI post-printing support removal machines. SVC is a process that immerses the 3D printed part in a support removal fluid. The liquid is then rotated to create a tumbling effect through a strategic pumping scheme, leading to breakage of the support material. Alongside SVC technology, the solution also utilizes PostProcess’ AUTOMAT3D software. The software automation provides a hands-free cleaning process with precision control over parameters, process monitoring and maintenance management to produce the desired finished part. The company claims that, with this total hardware, software and chemistry approach, the new SLA resin removal solution can achieve its ‘unprecedented processing times’, whilst maintaining the consistency of the end part. PostProcess will showcase the SLA Resin Removal technology at the AMUG (Additive Manufacturing Users Group) conference in Chicago on March 31st through to April 4th, in booth P21. The PostProcess DEMI support removal machine. Photo via PostProcess Technologies. With various industries pushing the adoption of additive manufacturing forward, there is in turn a focus on developing efficient post-processing technology for 3D printed components, to ensure a quality end-product. Riyadh-based chemicals producer SABIC has launched a breakaway material for FFF 3D printers, a solution designed to alleviate the manual effort required in post-processing. Suitable for parts with simple support structures, it is capable of being removed at room temperature. Furthermore, Vermont-based metal additive manufacturing company A3DM Technologies, and Spanish advanced technology firm GPA Innova, have entered into a partnership to advance the post-processing of metal parts produced by additive manufacturing. From the UK, Additive Manufacturing Technologies has developed the PostPro3D, an automated post-processing additive manufacturing system. The solution reportedly offers injection molded levels of surface finishing for 3D printed parts created using Multi Jet Fusion (MJF), Laser Sintered (LS), High Speed Sintered (HSS) and FDM technology. 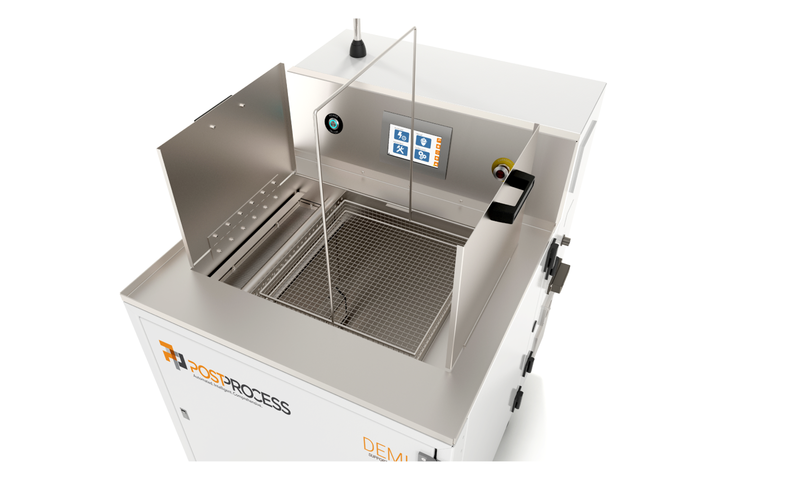 Finally, German post-production solutions provider DyeMansion has developed its VaporFuse Surfacing (VFS) post-processing technology for 3D printed parts, which is in the beta-testing stage. VFS technology also represents a step forward for 3D prints with surface finishes that rival the quality of injection molded parts. Featured image shows 3D Printed SLA Part with resin supports removed using new solution. Photo via PostProcess Technologies.